At least in Albuquerque, it’s no secret that winter is upon us. The low temperature this morning was 18º (F) and there’s a fresh dusting of snow on the [wikipop search=”Sandia_mountains”]Sandia mountains [/wikipop]to the East of the city. It’s the type of day that makes you look for a sweater and dream of pot roast. It’s also the type of day that makes me think of snow images. This one, ironically, was actually a fall image. During the Eastern Sierra workshop, with Gary Hart, we woke to fresh snow above Bishop California. It was a beautiful mix of fall color and fresh snow. I visualized the basis for this image but quickly found that finding just the right leaf, in just the right position, was a little harder than I’d expected. Despite the fact that we were shooting in a grove full of Aspen trees, it took me almost 15 minutes of searching to find this subject. An easier approach would have been to find a leaf of the right color and place it in the snow, but I really don’t get any pleasure from that. It’s much more satisfying to me when I “find” the subject. 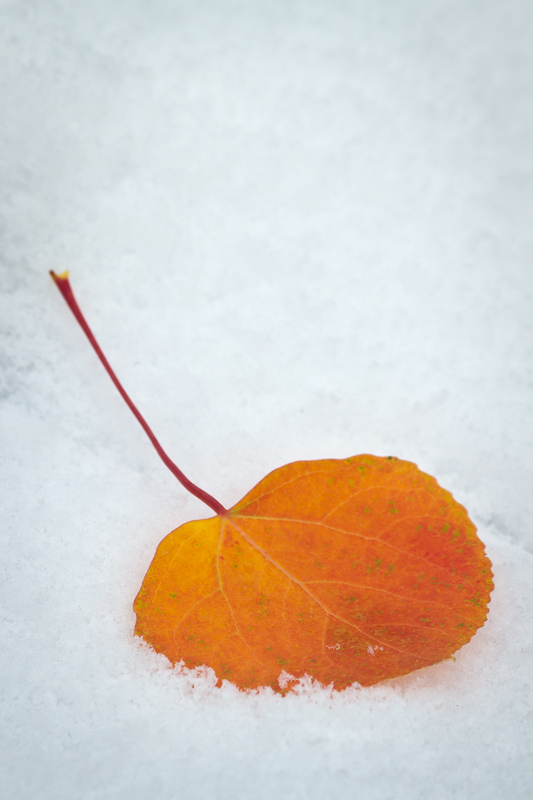 This entry was posted in Photography and tagged Aspen, cold, doug otto, Fall, Photography, snow. Bookmark the permalink.